An emotionally charged novel of five interlinked stories, all revolving around the crash of a JAS fighter jet on a practice run outside the Swedish city of Linköping. The reader is given access to the inner lives and workings of five seemingly very different people, who all have one thing in common: they have experienced both profound love and the depth of despair. 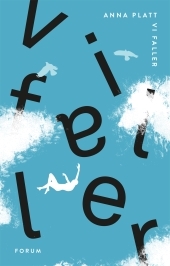 FALLING is a literary novel about feeling caught in a rut, searching for a way out. It’s about love and loss and the human condition. And about getting back up when things seem impossible.